Presented here is a circa 1870 Antique French Statuary Mantle Clock, featuring 2 Horses and a young man in sculpture form. The statues, while not signed, are reminiscent of the Horses at Marly, made by the famous French sculptor Coustou who crafted similar horses in marble, bronze and other forms for Louis XIV in France. This clock, based on the maker's mark, was made by Japy Freres (one of the most prominent makers of fine clocks in France in the 1800s) circa 1870. One aspect of this clock which is highly unusual, is that, we believe, the statues are made of aluminum, which at the time was more precious even than gold, with bronze and brass being in a different league altogether. Aluminum was more akin to the value that is placed on platinum today. Finding a clock in this form therefore makes this clock an especially interesting piece of clock history. The clock has the much less frequently found platform escapement movement, which allows it to keep great time without even needing any pendulum. This clock was just cleaned and oiled, runs very well, and is of the highest quality. 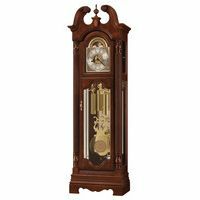 The clock is 20 inches tall overall, 16 inches wide, and 7 inches in depth including the statuary. 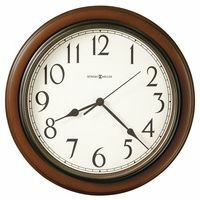 The clock's dial is 4 1/2 inches, and its bezel has what appears to be its original beveled glass. The statue, including its base above the clock, is approximately 12 inches in height. The clock chimes on every hour for the number of hours. The sound of the chime most closesly resembles the sound of a carriage clock. 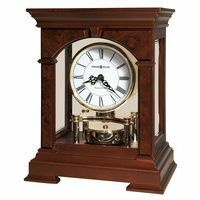 It is clear that when this clock was made, careful effort went into fitting the complex movement into the case with limited depth. The back cover of the case is glass, with a hinge, and is clearly not original to the clock. Having said that, the clear glass back makes the clock more attractive to view from the rear. The silvered dial is in very good shape, as can be seen in the pictures.A key is included.